Compare the effectiveness of the poet's use of the dramatic monologue in 'My Last Duchess' and 'Porphyria's Lover'. Assignment 2: English Literature: pre 1914 Compare the effectiveness of the poet's use of the dramatic monologue in 'My Last Duchess' and 'Porphyria's Lover' These two poems are both about love and a relationship; however they are not the type that ends happily ever after. They both represent a man's love for a woman and reveal faults they have in their relationships. As in all dramatic monologues the personality of the narrator is revealed through what he says, the words he uses and his point of view about events. For instance, in 'My Last Duchess' we see an example of a man with too much pride from his line 'I choose to never stoop'. We then see possesiveness and insecurity in 'Porphyria's Lover' when the protagonist strangles his love because he wanted her to 'give herself' to him 'for ever'. In both poems setting is very important in revealing character. The scene is set in Porphyria's Lover at the beginning with personification, saying that the wind 'did its worst to vex the lake'. ...read more. We see immediately what sort of a character Duke is from his intriguing attitude towards the picture while he explains about his 'Last Duchess'. He seems to present her as 'just another object in the room' as we have already seen with his possessive pronouns however he describes her in great detail and depth. 'Her mantle laps' and the 'Half-flush' that dies along her throat' shows his surprising attention to her, of course it seems to be her physical beauty he has observed rather than her inner person. 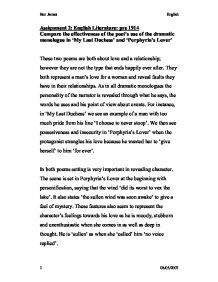 Porphyria's Lover's main character seems to unravel more steadily, beginning with the weather characteristics which have already been stated and moving on to describing Porphyria earlier rather than revealing details about her lover. There are many sensual and rich descriptions about her including ''Her smooth white shoulder' and 'her yellow hair displaced' which shows how attractive Porphyria is and helping the reader to see how the lover is jealous of her life when away from him. Through the words in 'My last Duchess' we can tell that the female is a warm and passionate character with his affectionate vocabulary to explain her features before his absent minded murder. ...read more. His obsession was so great that he could not take the fact Porphyria may have had 'vainer ties' when perhaps she did not have any at all. He did not want to face losing her in any way and was deep in thought until he found what he thought was the only solution. I thought 'My Last Duchess's' main character was far more critical of the woman and had found an irritating factor about her which he used as an excuse to kill the poor Duchess. He had had more wives before that as obviously stated in the title and I began to wonder whether he was just using them to create a better appearance for himself and wondered what had happened to the others. I also found it a shame he had wasted a life he seemed to know so little about. It was as if he just thought about her as a beautiful possession like the other works of art in his home. Ben James English 1 08/05/2007 ...read more. This student written piece of work is one of many that can be found in our GCSE Robert Browning section. Robert Browning's Use of the Dramatic Monologue. In Fra Lippo Lippi we come to know - almost intimately - one of the great painters of his of the Renaissance as he is imagined by the poet: we learn about his escapades, his introduction into a religious order, and his ideas on art all of this through what Fra Lippo and beauty and religion. drawn for you, but I]', this reveals the Duke was still conscious of hiding the beauty of his wife away from any onlookers. He demonstrates complete control over the portrait, as it is only he who draws the curtain aside. It exposes the similarity of possessiveness between the two speakers. 'Porphyria's Lover' opens with an atmospheric picture of the weather, perhaps suggesting pathetic fallacy, reflecting the mood of the narrator. The first impression the audience is given of the lover is of his "heart fit to break", suggesting his unpleasant mood, supported by "the rain" and "sullen wind" outside. "I choose never to stoop". This is another point Browning exposes about the stereotypical characteristics that the men and women had, and how the characters in the poem, were totally different to what we would expect of them. The Duke has no appreciation for women and he has a hatred for them. His blunt assertions of superiority are frequent throughout the poem, but the most poignant assertion of superiority is: '...as if she ranked My gift of a nine-hundred-years-old name With anybody's gift. (Line 32-34). This line lends the Duke an impression of an egocentric man who places himself above other men. He has killed her in his own way which quite unusual. Not everybody would strangle someone to death by their own hair. In the poem My Last Duchess obsessive love is shown, as the Duke is still admiring his wife who died 3 years ago, by looking at her picture which is painted on the wall.